Divorced. I've been living in France for four years. 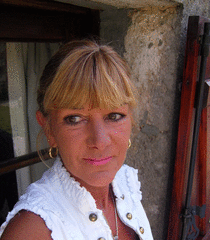 I love the French way of life and would love to meet a likeminded guy who doesn't take life too seriously. I'm hoping to meet someone who is interested in the spiritual side of life, I'm not religious but I am a deep thinker with a sense of fun. I love walking in the countryside, yoga and meditation. My friends tell me I have a great sense of humour and that I'm good company. My perfect evening would be a bottle of chilled champagne and vegetarian food under the stars in the summer or in front of a roaring fire in the winter. I am a performing arts graduate and a hypnotherapist and psychotherapist, but don't let that put you off! My perfect match would have a great sense of humour, be interested in the spiritual/psychic side of things and have a relaxed attitude to life. If you are a stressy or possessive person, we wouldn't get on. I believe that the key to a successful relationship is allowing people to be who they are. I wouldn't try to change you and you would need to feel the same. If you like to live every day as though it's your last, then we would probably get on.